It’s clean and dry and rodent free. It’s all undercover and easy to access with plenty of trolleys. Plenty of packing supplies reasonably priced too. Also good there’s a toilet if you need it. Best of all are the friendly and helpful staff. This is definitely the place to use especially if you want to be able to access what you store. Highly recommended! Decided to hold our stuff that we valued alot here while we moved to Oz until we settled over there. Was so handy for us we kept our stuff in storage for nearly 7 years. Finally moved back home so taken our stuff out. Have had the best service, no stress, and our things well looked after. Thank you for such an awesome experience and taking care of our thing for so long. Highly recommend!! The staff at Storage King Henderson is very friendly , Professional and willing to help with all our requirements . Location is very convenient and comforting to know that the Police Station is 100m away . 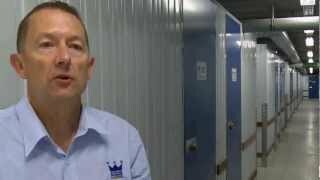 I would recommend Storage King Henderson to anyone who requires highly secure storage for their goods short or long term . Storage King Henderson is a great storage facility. The minute I walked in I was impressed. The office was nice and the staff were friendly and professional. When I was pricing around for a storage facility to rent, SKH had the best prices that met my budget and needs (thanks to a special they had going on). It's a large indoor and covered storage facility with ventilation system. There are literally 100's of units in this place. I would rate this as one of the more secure storage facilities I have come across because of their individually alarmed units. Very quick and easy sign-up. Large loading dock for trucks, and easy elevator access for upstairs units. The place is kept very clean. Staff is always present and very friendly and helpful. Just a note on the Storage King TRAILER - it's "FREE" of charge when moving in!!! Overall - Great Facility, Great Location, Fantastic Staff and Competitive Rates...HIGHLY RECOMMEND!!! Storage King Henderson proudly services Te Atatu South, Te Atatu Peninsula, Ranui, Sunnyvale and Kelston.